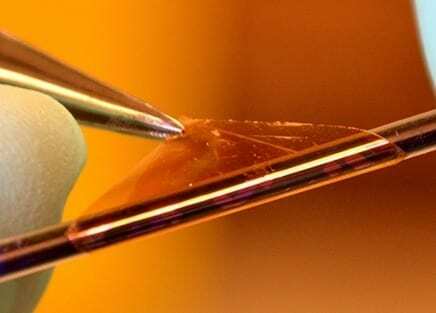 This transparent transistor, which functions even when wrapped around a thin pen, could help make flexible electronics widely accessible. As tech company LG demonstrated this summer with the unveiling of its 18-inch flexible screen, the next generation of roll-up displays is tantalizingly close. Researchers are now reporting in the journal ACS Nano a new, inexpensive and simple way to make transparent, flexible transistors — the building blocks of electronics — that could help bring roll-up smartphones with see-through displays and other bendable gadgets to consumers in just a few years. Yang Yang and colleagues note that transistors are traditionally made in a multi-step photolithography process, which uses light to print a pattern onto a glass or wafer. Not only is this approach costly, it also involves a number of toxic substances. Finding a greener, less-expensive alternative has been a challenge. Recently, new processing techniques using metal oxide semiconductors have attracted attention, but the resulting devices are lacking in flexibility or other essential traits. Yang’s team wanted to address these challenges.